Top200Rx® is located in leading pharmacies and health facilities nationwide. Top200Rx® is the leader in Rx health literacy information and for the pharmaceutical and health care industry. Top200Rx® is the premier provider of immediate, reliable and health literate appropriate prescription medication information at the touch of a button. Top200Rx® is America’s resource for simple and easy-to-understand prescription medication information. Top200Rx® is accessible through touch screen automated kiosk’s at local pharmacy or health facilities. 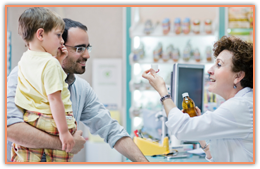 All medication information is written with the consumer’s health literacy needs in mind. Top200Rx® goes beyond the traditional small print and data-ridden packaging insert. Information provided is user-friendly, and emphasizes compliance with prescribed medication and augments the pharmacist consult. Top200Rx® is located where consumers already shop - leading pharmacies, health facilities nationwide. Top200Rx® easy-to-use and convenient touch screen makes getting prescription medication information easy. Top200Rx® provides this information in the generic or brand medication name for convenience, this assures the consumer that they are receiving only the best.